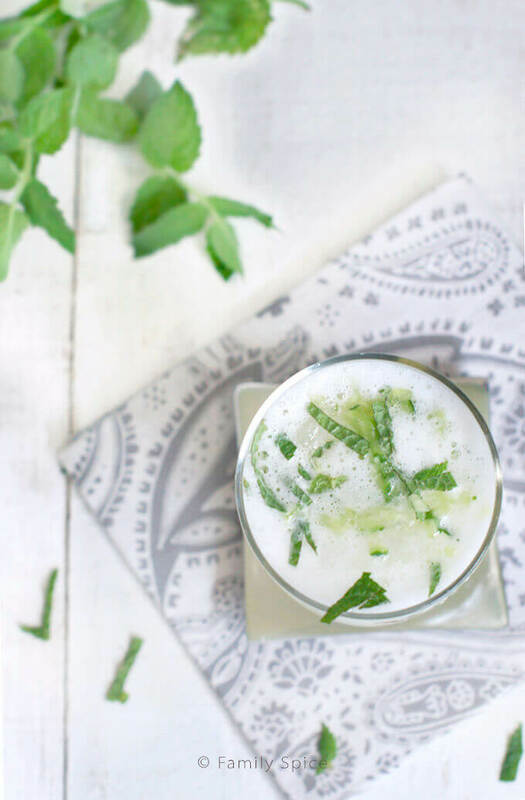 This Vodka and Mint Fizz combines sakanjabin (Persian mint syrup) with vodka, lemon juice and a raw pasteurized egg white to make a tasty, frothy cocktail. Sponsored by Davidson’s Safest Choice Eggs™. We have only had 8 days of school, but the entire family is ready to unwind during this 3-day weekend. I’m thinking beach time, pool time, some chill time and a bit of cocktail time! I’m not a big drinker, as I’ve shared before. My husband calls me a cheap date since I’m quite a light weight. So when I do drink, I tend to choose drinks that are light and go down smooth. 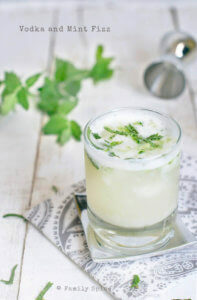 And that’s how I came up with this Vodka and Mint Fizz. When Davidson’s Safest Choice Eggs™ asked me to come up with a cocktail recipe using their pasteurized eggs, I admit: I was baffled. Eggs and alcohol, what should I do? Luckily, a friend of ours had recently taken a mixology class for fun. I picked her brain and she opened my eyes to all of the possibilities. The addition of an egg white that is shaken in a drink adds body, froth and a creaminess to make one special cocktail. I decided to use up some Sekanjabin (Persian Mint Syrup) that we always have in the house. 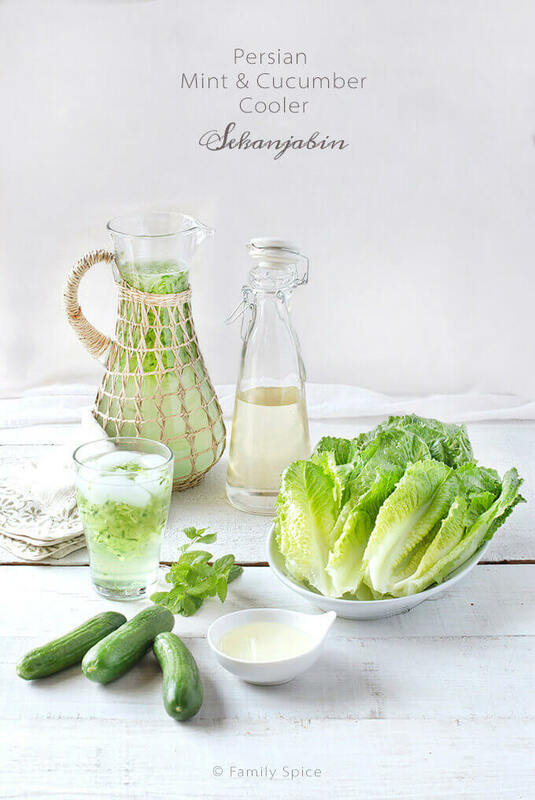 Used to dip lettuce in or mix with water for a refreshing drink, we love our sekanjabin. Not like a traditional mint syrup, ours has a little kick with a touch of vinegar. I combined sekanjabin, vodka, lemon juice and an egg white and shook the daylights out of it. “Shake it dry, then shake it with ice,” my friend advised. Another cocktails with sekanjabin is my Cranberry Liqueur with Persian Mint Syrup (Sekanjabin). 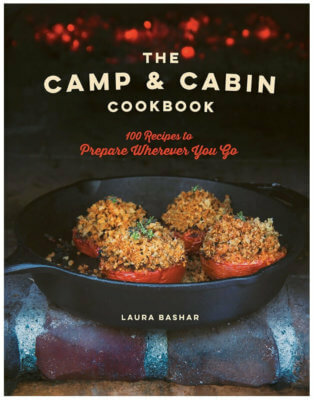 Give it a try and chill out this weekend – I know I am! Disclosure: As I am part of the Darling Dozen, I did receive a stipend from Safest Choice Eggs™ to develop a cocktail recipe using their product. The story I have written is all true, and the opinions are truly mine. If I didn’t like it, I wouldn’t blog about it! This is all new to me but wow, it looks good! Good drink! Some of the sours – like whiskey sour – traditionally have egg white in them, although most people don’t use them these days. I love the look of the foam, though. Fun post – thanks. Wow – I just arrived on a Tweet from Trevor Kensey, and this is a gorgeous post and a fabulous drink. Thanks!